Hobo International's traditional styling has made it a favorite amongst conservative fashion fans, but I must admit many of its accessories leave me a bit bored. So when one catches my eye like the Caralee it's reason to take a closer look. 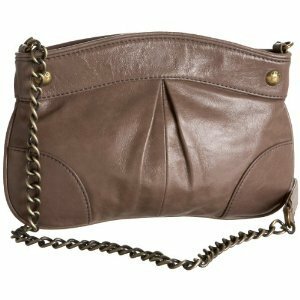 This cross-body purse is simple but so compelling with its clean curved shape and V-shaped center pleat. I wish the exterior was made with authentic leather rather than a manmade substitute, but then we might have spent more than $118 on it. The synthetic is more convincing than many leather alternatives, so perhaps it's a sacrifice worth making. The Caralee looks dainty but it's surprisingly practical. There are so many pockets hidden away inside that staying organized should never be a challenge. I also like the strap which gives us the best of both worlds, the vintage charm of an antique brass chain and the comfort of a soft synthetic center. Hobo International's traditional approach can often seem uninspiring, but I think it's got things right with the Caralee. The Hobo International Lulu bag, a great alternative to this cross-body bag.